He is popularly known as the 'DK Bose guy'. 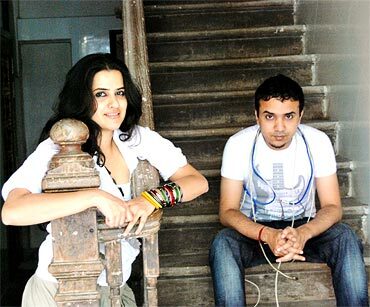 Ram Sampath has just become a hit with directors and fans thanks to his innovative score for the hit film Delhi Belly. Ram and his business partner-singer Sona Mohapatra talk to Sonil Dedhia about their collaboration with Aamir Khan, and what Delhi Belly has done for their careers. How has your life changed after Delhi Belly? Ram: It's not changed. We are still working hard and as usual we are still doing a lot of work outside films. Sona: Our bigger dreams and bigger plans are outside the whole gamut of films. Ram: Neither of us wants to be stuck in the rat race. I don't want to be known as a music director who works on a dozen films at the same time. How is creating music for ad commercials different than movies? Ram: The biggest difference is that advertising doesn't let you stretch your imagination beyond the two-minute duration (of the ad). So, those with a creative hunger will want to express themselves on a larger canvas like cinema. But I hope to keep doing commercials along with my feature work. Ram, you had mentioned in an interview that before Delhi Belly, you were struggling on the fringes, so bagging the movie was a huge thing for you, wasn't it? Ram: One of the most important things is that you need a good canvas to be able to showcase your work. Some of my strongest work comes on Sona's albums but the fact is that it doesn't reach out to the same kind of audience as a film does. Sona: Another important thing is that people today remember the songs and not the artiste or the music composer behind the song. Ram: What I mean about struggling on the fringe is that to be able to get your work to the audience is a struggle. Workwise after the Krazzy-4 incident, we did go through a lull period but I came back very strongly with the Tata Docomo jingle. It helped us raise our profile in the advertising industry. Who approached you for Delhi Belly? 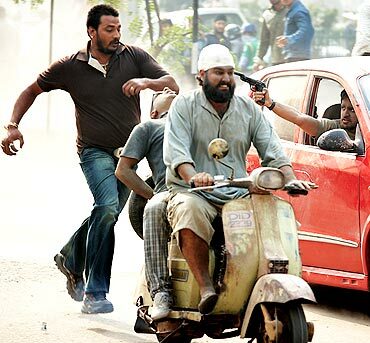 Ram: (Director) Abhinay Deo recommended me for the movie. He and I go back a long way; we worked together in advertising. When he recommended me for Delhi Belly, Shankar-Ehsaan-Loy were already signed for the film. There was another director who was signed who ultimately dropped out. Aamir Khan and Shankar-Ehsaan-Loy were gracious enough to allow me to work on Delhi Belly. 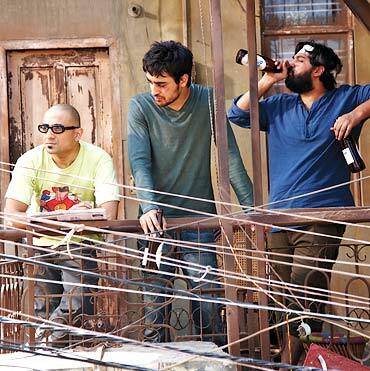 Delhi Belly has changed the music score in the industry. Where did you get the idea? Ram: All the songs that I composed were accepted. The interesting part of Delhi Belly is that I wanted to show love and heartbreak in all the songs which I did. (Scriptwriter) Akshat Verma set the tone by writing words like Jaa Chudail, Kisi Naali Mein Gir, Bhaag DK Bose Aandhi Aayi Hai, Teri Tirchi Nazar Ne Dil Ko Kar Diya Penchar, thus giving Munna Dhiman and Amitabh Bhattacharya the cue on their respective songs. What was the inspiration behind DK Bose? Ram: I wanted to make a punk rock song with a lot of eastern influences. There are a lot of punk rock songs like DK Bose but the fact is that it stands apart is because it comes from our ethos. The melody is quintessentially Indian. There was lot of folk influence on the song. So the brief in my head was Indian folk meets punk rock. If you are a cinema fan then you will realise that this song has shades of the music in Danny Boyle's Trainspotting. I wanted to subvert that and make something else, which I did. The movie was stuck for a long time. Did you fear that it would never be made? Sona: Initially, Delhi Belly had just one song and while the film was going through a lull period, Ram composed some eight or nine songs. 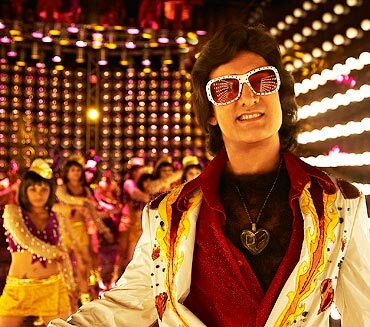 There were times when I doubted the film would not be released but once Aamir Khan came in, things were completely sorted. Ram: The thing with Aamir is that he is a focused producer. He never mentioned that the film won't release. I remember I had messaged Aamir to come and hear all the songs and when he came, we became confident about the project. Do you try to bring in new elements to your songs? Or does the film's director largely dictate the choice? Ram: The trick of film music is to put yourself in it and also remain true to the writer and the director of the script. I realised that the producer and the intention of the producer are very important. A lot of times during a project you need to be protected and I think very little credit is given to the producers. How do you know that the music will appeal to the audience? Ram: The only thing that matter to me is whether it is true to the script, the director, and then whether I like it. If we as a team like it, there is a very good chance other people will like it. Trying to speculate what audiences will like doesn't work for me. Musically, our audience is very sophisticated. We are the only culture in the world where classical singers like Sonu Nigam, Shankar Mahadevan and others are operating in mainstream cinema. People like the Wadali Brothers and Rashid Khan also do films. We also have poets like Javed Akhtar and Gulzar doing lyrics for films. What kind of changes do you see in the film industry today? Ram: There are two big changes in the music industry. People don't consume music as they used to do earlier. Secondly, what is perceived as commercial music is very different from what my tastes are. Sona: It's amazing that directors like Tarun Mansukhani or Abhinav Kashyap have written to me when one of my albums has released to say how much they loved it. We don't know them personally or socially but if I bump into them, they still tell me the same thing. I think it will still take time for directors to add songs like Abhi Na Ana in movies. The point is that there are very few directors who want to experiment with music. Ram: One of the things that I was trying to do with Delhi Belly was to make film music interesting and to try and use it in a different way. How did you use it in a different way? Ram: The movie had just one song. I pushed myself so that I could make a new space for interesting music in Bollywood. Haven't music composers like Amit Trivedi and Amitabh Bhattacharya already created that space? Ram: No, I don't think so. It's one thing to make a film with a lot of songs. It is another thing to be able to make the soundtrack that is in conjunction with the film but not necessarily shove every song in the film. In Delhi Belly, the film is one entity and the songs are another entity and where the two meet and traverse is the high point. A better example would be a film like Delhi 6. Sona: I always tell Ram that he is a little ahead of his time. He formed a rock band 15 years ago and did a film like Let's Talk almost seven years ago which had a lot of fusion music which a lot of people are trying to do now. Amit has composed some fantastic music for films like Dev D and Aamir. Ram: I am really proud of Amit. I am very fond of him. He is doing some stellar work. You mentioned in one interview that you don't care what the West thinks about our music. Do you think our music industry is more sophisticated? Ram: I don't know if it is more sophisticated, but I am sure it is less compartmentalised. In the West, what happens is if you are composing pop music, you only do pop music.In India, we are not a culture which likes to consume just one flavour and in that sense Bollywood music is a blessing because you can do different genres in just one film. When you are in a new place, do you pick up the music of the place perhaps sub-consciously? Ram: Yes, we do. One of things on which there is much friction between me and Sona is the number of concerts we end up watching when we travel. We sample a lot of music. Sona: Yes, we do music 24/7. We go to a place to travel and enjoy and he slips in three concerts a day! The next time we travel again, I'll make sure I am not planning to attend any concerts. Sona: I did my engineering and then went to do my MBA. I was working as a brand manager when Ram Madhvani (who directed Let's Talk) said he would introduce me to Ram Sampath. Immediately, a picture popped up in my mind of a middle-aged, pot-bellied guy who would play a harmonium. His name is so deceiving. He kept me waiting for six months but when I finally met him, we clicked instantly. How would you define his work? Sona: It is always conceptual. I don't think there is anyone whoa works in so many layers as he does. He is informed beyond music, which is something which I find very exciting. He is very well informed about all things. Bhaag DK Bose is your debut as a singer, how did that happen? Ram: It's purely because of Aamir and (his wife) Kiran. I sang a scratch vocal, as I normally do, to help the singer learn the melody. Kiran jumped up and said that she wasn't going to allow me to record it with any other singer. And that's really how my voice stayed for the song. Aamir had some reservations about my diction and so I took his corrections on board and that's how DK Bose was made. What made you take Sona to sing Bedardi Raja in the movie? Sona: Advantage of having in house talent (Laughs). Ram: Oh no. I have to tell you that Sona and I were very much together when I did Khakee but she didn't do a single song in that film. There was a song called Mere Maula in the film which would have suited her voice but it was meant to be sung by Richa Sharma. Sona: (Jokingly) I am hurt now. Ram: But you were in the studio when Richa was recording the song. Casting is my call and for Bedardi Raja I always had Sona in mind. Sona: Who else would have sung such an ashleel (sleazy) song for you? What is your take on the work of your contemporaries like Amit Trivedi, Amitabh Bhattacharya, Mithoon to name a few? Ram:What is good about our generation is that we are all friends. Inherently we all know how much work we can do. There is a certain sense of security and that's what makes this scenario interesting. Do you feel that the industry is divided into Shankar-Ehsaan-Loy, Pritam, Vishal Dadlani on one side and people like you and Amit on the other? Ram: I have no connection with what is happening with them. I respect what they do but I don't want do what they are doing as I am not interested in it. To be honest, that world doesn't exist for me. I don't watch those movies or listen to those songs. I am in my zone and I hope to stay that way. Sona and I got into music because we didn't want to get into the rat race. You said that you didn't want to be a part of commercial films. Sona: Did you say that? Ram: No, I never said I don't want to do commercial films. May be I was misquoted. But I am sure that I won't do films that are made purely for commercial reasons. I want to stay away from these films. What interested me about Khakee was that until then people always perceived me as a person that does modern work. People knew my music. I had done an album called Tanha Dil with Shaan but no one approached me for melodies. Khakee gave me that opportunity and I am still very proud of Khakee. Sona, do you have the same opinion, is that reason we don't see you doing a lot of playback? Sona: I'd be a hypocrite if I say that I didn't ever want to sing in films. But films are not my priority. People think that if a singer has come out with a private album the next best thing after that is to do playback singing. I am also a bit fussy because I am very much driven by performing live rather than performing in studios. Is your best yet to come? Ram: I hope so. I think everything comes at a certain time for a reason. After being in the industry for quite some time, I have been allowed to make my mark. I am not feeling any pressure to deliver and Delhi Belly is behind me. I want keep my work interesting for myself. Where do you go from here? What next? Ram: One of the interesting that will happen after Delhi Belly is that there will be a lot of interesting films that will come my way. I have got some scripts but I'll take time to decide. I am already working on Reema Kagti's next untitled venture. I am also working on Sona's next album.